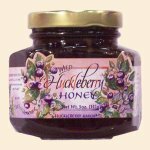 Pure Clover Honey flavored with Real Wild Huckleberry Juice. Also available in an 11oz size. Ingredients: Clover Honey, Wild Huckleberry Juice.